Introduction to capitalist game: You working for money vs. Money working for you. It’s hard to review a perception changing book; but I am going to try. Rich Dad, Poor Dad presents a different way of thinking about money. Why rich get rich and keep getting richer vs. why poor get poor and keep getting poorer? How do rich vs. poor people think, behave and look at money? It was genius to start with a narrative. A 12 years old version of him and his best friend Mark, learning to make money. The Poor Dad (Robert’s dad) – who is a school teacher and has a typical middle class view of money. He works for money. Compared to Rich Dad (Mark’s dad) – who is soon to be rich guy. Not very learned but he knows how the money works. He often has opposite view about money, compared to the poor dad. His money works for him. The narrative makes learning the concepts presented in the book much easier. Basic education teaches you to work for someone else and encourages you to play it safe. It doesn’t teach you essential skills like – how money works, how to spend money, and how taxes work etc. Specialisation is a further trap. You get depended on that industry and specialisation. Be a good investor – don’t put all your eggs in one basket – diversify your skills. Money is a great employ but a bad master. Most people work for money, thus become salves of it. Learn to make money work for you instead of working for money. Learn the difference between liabilities and assets. Acquire more assets and cut your liabilities. Instead of trying to avoid the risks, learn to the manage the risks. Rich invent the money. It’s not something real; it is what we agree it is. What corporations are and how they work for the rich. How do taxes work? How rich end up paying less taxes than poor? How to invest? How to make your money work for you and multiply itself? Where to start? This is a very scanty overview of what all the book packs. It’s full of comparisons, arguments, concepts, stories ideas, suggestions, etc. At times they might seem impractical, exaggerated and the book might seem more philosophical than technical. But that’s what this book aims to be – an introduction to a new way of thinking about money or capitalist’s view of money. To change one’s perception, sometimes you have to increase the parallax. Robert Kiyosaki‘s writing is very repetitive and needs a lot of editing. And the structure of the book is messed up. From headlines to section division – it requires a lot of rework. The book might seem too vague, too basic and, at times, too philosophical. But it gives a good direction to start finding answers for questions you never asked; but should have. 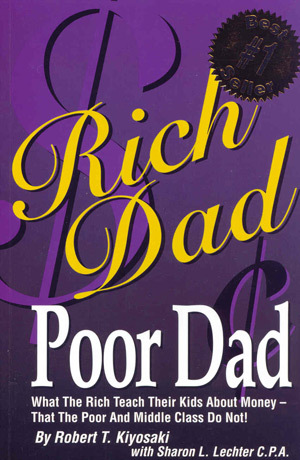 I wish I had read ‘Rich Dad, Poor Dad’ earlier. There is a difference between being poor and being broke. Broke is temporary, and poor is eternal. Unfortunately, for many people, school is the end, not the beginning. PS: That’s one horrible book cover. Published on August 26, 2013. Updated on August 26, 2013.